Part pie, part coffee cake. Elegant, easy, and incredibly versatile. 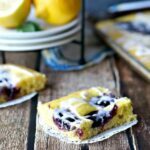 These bold and bright flavored Lemon Poppy Seed Blueberry Squares are a great new flavor variation of my popular Cherry Almond Squares. Sometimes I feel like my entire life would be better, could be better, if I spent more time in books. Now, since I work at a library I don’t mean just spend more time in books, because I am literally eye high in rooms full of books every single day. No, I mean spending more time reading books. I’ve always had the notion that I could absorb some of what I’ve read like a sponge. Like, if I read more classic literature, I’d sound more intelligent. If I read more comedy, I’d be more funny. If I read more adventure books, I’d be ready and willing to go out and face whatever came my way, head on. But the truth is, I don’t really read that many books anymore. Like everyone in the whole entire world, my excuse is dull–I just haven’t had the time. Now, I say this, but it’s not really true because I do still read. I spend a lot of time reading…Facebook. I read a lot of Facebook and I see a lot of what other people are doing in their lives. And it makes me feel like I’m not doing much of anything. And it’s the worst thing to read EVER. Sidenote: Sorry to my Facebook friends. I really do like you guys, but a lot of times your concert pics and cruise pics and even your cute puppy pics make me feel sad inside and then I have to go eat chocolate. But honestly, my favorite books to get lost in are cookbooks. I’m sure that’s no surprise to you. Just flipping through a cookbook I feel an infinite sense of possibility that I could create something amazing and it wouldn’t just be amazing to me, it could be amazing and nurturing and comforting to other people too! And that is what I like about food blogging. The infinite sense of possibility. I was thinking the other day there was nothing I ever really wanted to be when I was growing up. I don’t ever remember going through a stage where I wanted to be an astronaut or a vet or a lawyer. 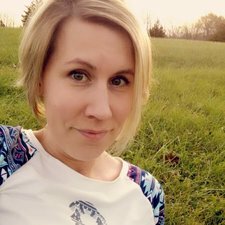 I do remember I wanted a job where I could dress nice, wear cute shoes, carry a brief case and walk around looking important. This was basically the parameters around my dream job as a child. I’ve gotten to do all of these things as a food blogger, but most of the time I’m not wearing shoes at all as I work and that’s nice. It’s also nice that I can choose to make whatever I want to for the blog. Even if it’s the 3rd variation of recipe that I really love. And yes, this week it’s the 3rd variation of a recipe I really love, this time with a lemon poppy seed and blueberry twist. It started with Cherry Almond Squares and my love for this simple pie, slash coffee cake recipe has just grown. Next came a raspberry and cream cheese version, and here we are today with this lemon poppy seed and blueberry variety. Not to brag, but these squares just can’t be beat. There is a reason that the original is my one of my most popular recipes; it’s easy, delicious, gorgeous, quick, and makes enough for a crowd! 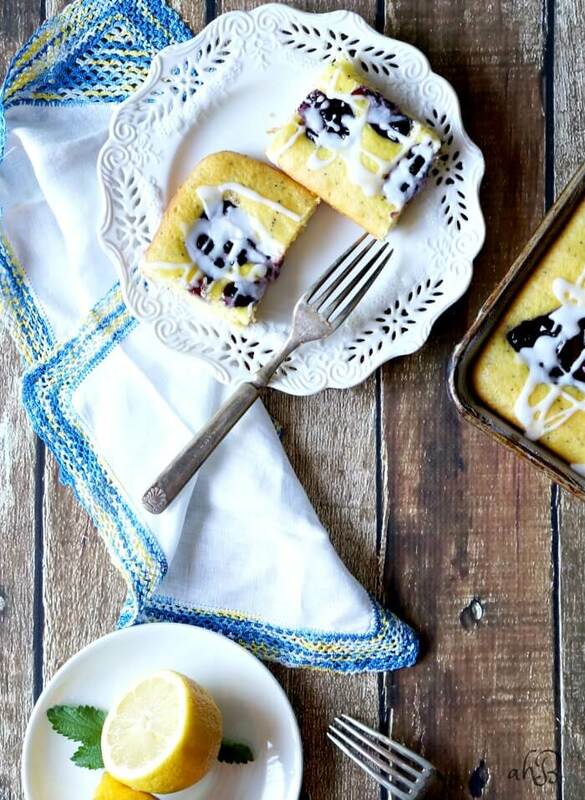 These lemon poppy seed blueberry squares start off again with cake mix, this time lemon cake mix. 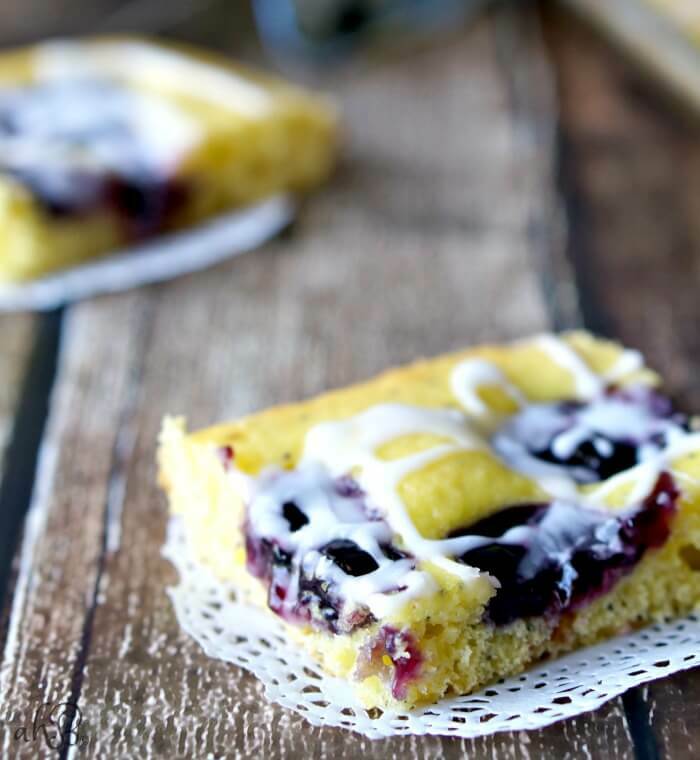 It’s combined with sour cream, water, eggs and poppy seeds for a moist and dense cake base that holds up well to the accompanying blueberry filling. Topped with a fresh lemon glaze, this dessert has a bright and fresh flavor combination that is sure to be loved. 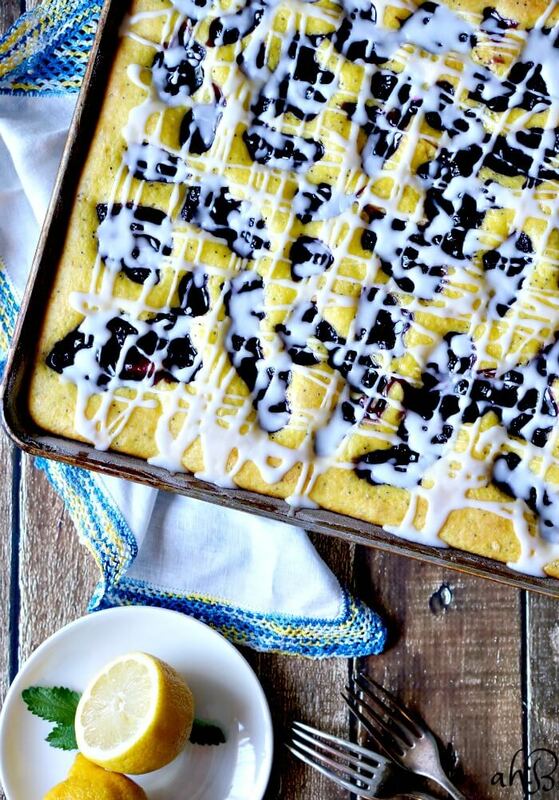 Top it with ice cream for a delicious pie a la mode, bake it up for your next brunch, these squares are truly my top personal go-to when I need to provide a dish for a crowd. I hope that you enjoy them as much as my family and I do. 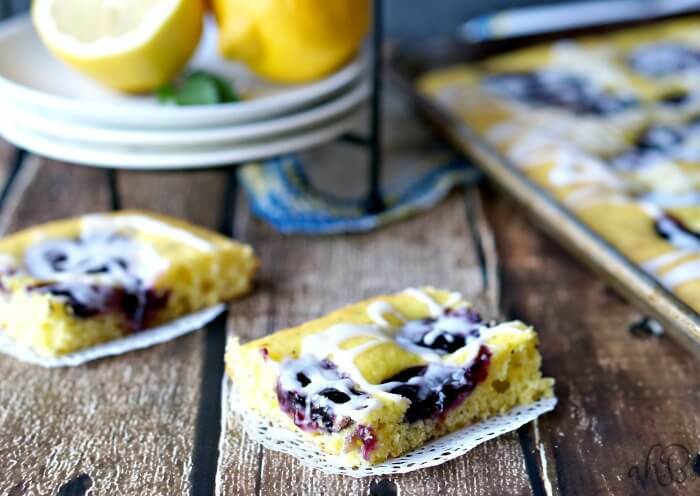 Delightfully easy, these Lemon Poppyseed Blueberry Squares make enough for a crowd. Generously grease and flour a 15½ x10½ x 1 inch jelly roll pan. In a medium sized bowl, mix together the sour cream, water, eggs and poppy seeds. Stir in the cake mix until moistened. The batter will remain slightly lumpy. Spread the batter evenly in the jelly roll pan. Drop the pie filling by spoonfuls over the batter. Bake until the cake springs back when touched lightly 25-30 minutes. In a small bowl, beat together the lemon juice and powdered sugar until smooth. Drizzle the glaze over the squares. And in regards to your friends on Facebook — I hear you. I have friends I think I may have to disown as they do so much — makes me look bad when sometimes my biggest accomplishment is Hey I got out of bed today! The last time I made these was for a church women’s tea. Great minds think alike!